Julia Mancuso has the most Olympic medals of any USA female alpine skier and recently added a bronze at the 2014 Sochi Olympics to her gold and two silvers. She is also a five-time World Championship medalist and seven time winner of world cup competition races. Born and raised in Reno, Nevada, she calls Squaw Valley home when she’s not training in Hawaii or travelling the world. In the midst of a hectic training and racing schedule leading up to the Olympics, Scout caught up with Mancuso for an insight into her love for Squaw Valley and her life. Scout: You call Squaw Valley Ski Resort home. What is it about Squaw you love? Julia: I grew up in the valley and it’s always been home for me. I love it because the mountain is spectacular. I never get bored, and I love all the views. 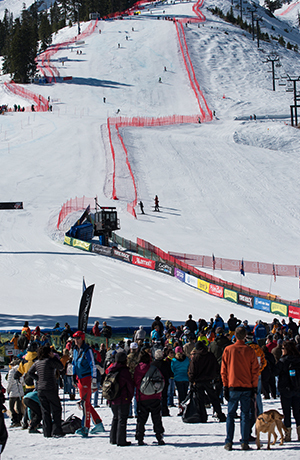 Scout: Following your Olympic Gold Medal in 2006, Squaw named a run after you - Julia's Gold. How cool is that!. Julia: I spent a lot of time training on that run growing up. So it’s cool to have it named after me. I think it’s more about trying to inspire the future generations of Squaw Valley ski racers by having a run where they train, and can push themselves to work hard and go for gold. Scout: If you're not in training, where do you go on a powder day at Squaw? Julia: I love to take laps on KT-22, you can lap all day and never ski the same run twice. Scout: What's your favorite apres spot in Squaw? Julia: Wildflour Baking Company is the spot to go for everything. The best food, and cookies. I guess it’s not the spot to hang out, but next door at Le Chamois and Loft Bar you can find your friends and cold beer. Scout: You've skied all over the world. What would be your favorite resort (other than Squaw of course) and why? Julia: I had a great time in the Three Valleys in France last year. We had a race in Meribel, and the terrain there is just never ending. We got some great snow one day, and I would love to go back and explore. Scout: You starred in Warren Miller's recent Ticket To Ride movie. How was that? Julia: I love to push myself in all aspects of skiing. Being able to sit in the helicopter and pick whatever line I wanted was incredible and I felt so much freedom out of the gates. It was awesome to be with a couple ripping girls, and we just had a really good time. Scout: And finally, do you ever get sick of lugging your gear around? Julia: I have learned to be a really efficient packer, but yeah it’s tough. I don’t bring that many clothes with me … it’s more the other stuff like supplements and workout gear that take up my whole bag.